Aqua - Enzyme & Probiotics Complex - Aniruddha Enterprises Pvt. Ltd. The gut is a fundamental organ which carries out two equally important functions, i.e. digestion & infection prevention. A healthy gut is essential for efficient conversion of feed for optimal nutrient absorption. If gut health is compromised, digestion & nutrient absorption will be affected, and fish or prawn performance & health will be threatened. To elicit well-functioning & healthy gut, a multi-pronged approach is necessary, from the point of view of immunology, microbiology & nutrient absorption. ProDense* is designed to act in 2 ways. Direct Acting Enzymes increase nutrient availability & absorption of feed nutrients in fish & prawns. 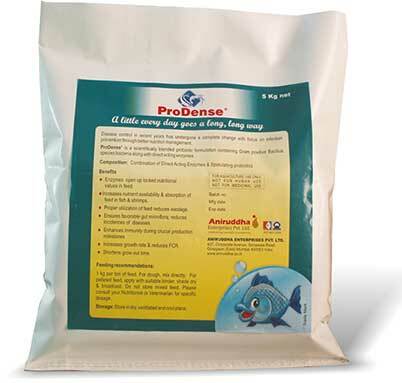 Gram positive Bacillus probiotic bacteria in ProDense* ensures rapid propagation and stabilization of favorable gut microflora enhancing immunity Regular use of ProDense* ensures that the fish & prawns remain healthy and achieve good growth without disease interruption.